(AP) WIMBLEDON, England - Roger Federer earned a record 32nd Grand Slam semifinal berth and moved closer to a record-tying seventh Wimbledon title when he beat Mikhail Youzhny 6-1, 6-2, 6-2 Wednesday. Federer's opponent Friday will be defending champion Novak Djokovic, who beat Florian Mayer 6-4, 6-1, 6-4. 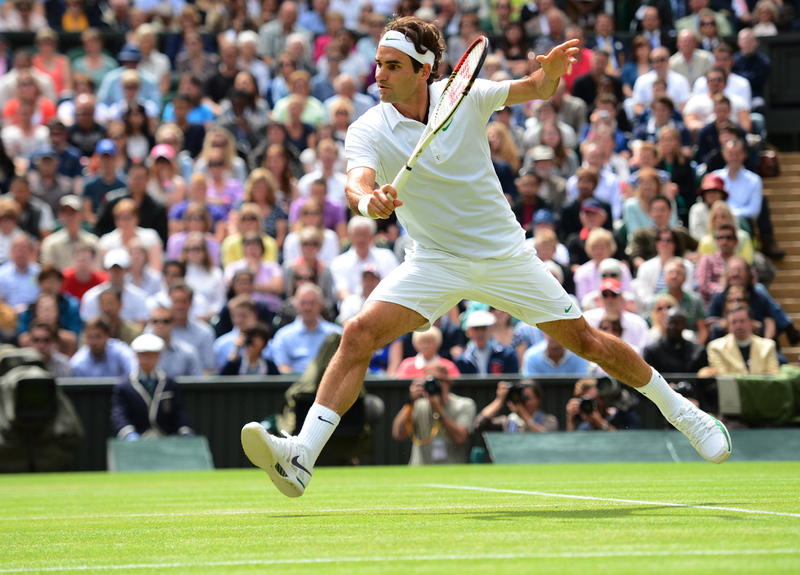 Federer has a 14-12 edge against Djokovic, who is ranked No. 1. They've met in Grand Slam semifinals five times in the past two years, with Djokovic winning four of those matches. They've never played each other at Wimbledon. "A nice matchup," Federer said. "I'm looking forward to that," Djokovic said. "It's always a pleasure playing against Roger. Obviously he's a great champion. He has been so dominant and consistent in these Grand Slams, and he's really an ultimate challenge on grass courts." Federer had been tied with Jimmy Connors for the most major semifinals. He reached the final four at Wimbledon for the first time since 2009, when he won the title. Against the No. 26-seeded Youzhny, Federer showed no sign of the back ailment that prompted him to seek treatment during the first set of his previous match. In the second game he converted his fifth break-point chance, and pulled away from there. A brief rain delay couldn't slow Federer, and neither could Youzhny, who seemed pleased at times just to win a point. Late in the first set, when he hit a running scoop forehand cross-court for a winner, he raised both arms and grinned as the crowd roared. When Youzhny failed to convert a rare break-point chance in the third set, he let out a primal scream that had fans laughing. The Centre Court audience included Prince William and wife Kate, Andre Agassi, Steffi Graf and Rod Laver, all sitting in the Royal Box. "I think it helps when royalty shows up, and other legends of the game come and see me play," Federer said. "It's inspiring." Federer improved to 14-0 against Youzhny, his best record against any opponent. Federer has lost only three of the 35 sets they've played. "My game maybe suits up well against his," Federer said. The No. 3-ranked Federer seeks to match the record of seven Wimbledon titles set by William Renshaw in the 1880s and tied by Pete Sampras in 2000. If he wins the title, he'll reclaim the No. 1 ranking from Djokovic and tie Sampras' record for most weeks at the top. Djokovic, playing on Court 1, closed out his quarterfinal victory a few minutes after Federer and had only a little more difficulty. The Serb lost his serve for the only time in the fifth game but immediately broke back. Serving at 4-all, he fell behind love-40 but erased all three break points, then broke to take the set and the lead for good. Mayer, seeded 31st, did his best to stay in the match with his unorthodox style. He dug out a between-the-legs volley during one rally. A subsequent scrambling sequence required him to dive and hit a spectacular backhand volley, then rise and put away another backhand volley. But Djokovic dominated with his aggressive play, hitting 50 winners to 14 for Mayer. He slammed an ace to close out the win, then threw a fist and let out a scream, ready for his showdown with Federer.